Crash on I-15 in Bingham County. Why are so many people dying on Idaho highways? Whether it’s a smartphone, computer, GPS, MP3 player, or reaching for a VAPE pen, people are dying because they are preoccupied with a tech gadget and not their driving. In a survey conducted at the request of BOISEGUARDIAN.COM news blog, commanders in each of ISP’s six districts were asked to identify the “deadliest highway” in their district along with the proximate cause of fatality crashes investigated by troopers in 2016. As for the most common causes of crashes statewide, ISP listed “failure to maintain lane, going off the roadway and overcorrecting, driving left of center, inattention, or distracted driving.” All add up to watching something other than the road ahead. The two lanes of U.S. 95 in the Coeur d’Alene area were the deadliest in District 1 with several head-on crashes, according to Capt.John Kempf who also noted five fatalities involving commercial big rigs. 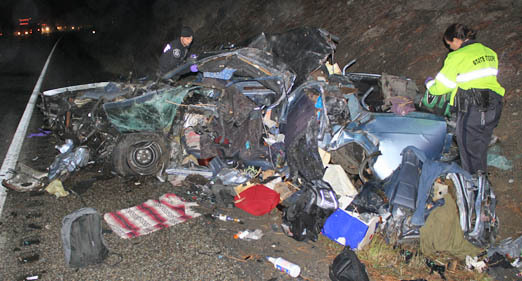 One of the more horrific crashes in the Coeur d’Alene area. In the Lewiston area U.S. Highways 12 and 95 tied with five fatalities each. Even if people can’t pay attention to their driving, they have a better chance of surviving if they at least wear their seat belts. As for the deadliest highways it is no surprise that busier routes had more fatal crashes. It is interesting to note that ALL of the limited access Interstates were the deadliest routes in each district. 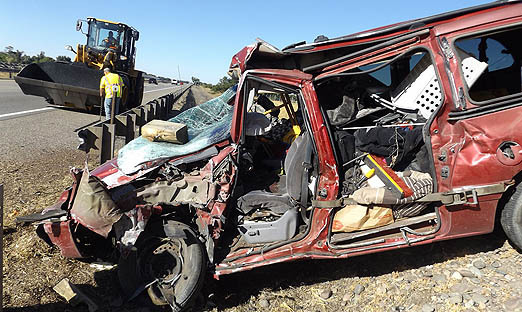 I-84 in southwest Idaho took first prize in the death count with crashes causing 15 deaths investigated by ISP in the Boise area. The GUARDIAN survey focused only on ISP fatality investigations. However, a total of 253 people lost their lives in crashes investigated by all police agencies during 2016. That is the most deaths on Idaho roads since 2006. In 2011 we hit a modern day low in traffic deaths of 167. Idaho Transportation Dept. has a DASHBOARD full of highway information. Crashes in cities and more populated areas have other deadly causes involving stop signs, failure to yield, following too close, pedestrians, speed in congested areas, DUI, etc. I would offer 80 mph is also a deadly speed. I recently had the need to go to Kimberly, ID from Caldwell. It was great going down there at 80 mph but I was towing a 19 ft boat on the return trip. That speed made the trip nerve wracking. I tried going slower but cars and large trucks were going at least 85 or more going around me. Frankly, it scared the crap out of me. Also, I wonder what the traffic engineers have to say about all those large trucks pounding down the interstate do to the longevity of the pavement. I think 65 in the metro areas and 70 in the rural parts of the interstate is plenty fast. I would love to see the studies supporting the new and improved 80 MPH speed limits. Poor discipline and ignorance of the danger. Poor discipline and ignorance of the danger. Tech is always gonna be there. Distraction is always gonna be there. It is lack of discipline. It is lack of danger awareness. All those five star vehicle safety ratings are for relatively slow crashes, 85 mph and tumbling like a football through the rocky median of an Idaho road is not one of the crash tests. Dave, I wish you could ride in an airliner cockpit with a headset on and go to a place like Chicago or NYC on a nasty night with a full boat a sick passenger and a technical fault. Sounds kinda sticky. You’d think there would be some distracted piloting going on. But no, no there is not. Further evidence is the coppers themselves are fiddling with computers while driving and rarely crashing as a result. The average wheel gripper is a dope. This latest snowstorm has reminded me of just how incompetent, negligent, ignorant, and just plain stupid the average driver is. I wish the driver education could somehow safely incorporate a 35mph crash with rollover. The maximum speed limit needs to be 70, and 55 or less on anything two lane. Slower makes being a terrible driver a lot safer. 80-85 is too fast for most drivers and too fast for many vehicle and tire designs too. Our local highway district only installs a rural four way stop signs and trims the brush back after a death. Permitting 50-60 on Eagle is murder considering the the average driver. It isn’t really surprising that all of the deadliest sections were on divided highway. That’s true because speed limits are higher there (regardless of what the speed limit is). Higher speed makes for more severe accidents. As for distracted driving, I laugh when they outlaw texting or hands-on cell phone talk. Hands free conversations are equally distracting as are eating, fiddling with the electronics, and any number of other things that people do while driving. As for cops being able to do it safely when the rest of us can’t? Baloney. And trucks? Horrible. I have seen them with tablets on the steering wheel! They routinely drift off to the right and then have to correct. Thanks for focusing some attention on this deadly problem, Mr. Guardian! In my case, you are preaching to the choir! 31 years ago, when I started riding a bike as my default (local) transportation, the prospect of drunken drivers made me nervous… but I rationalized that they are mostly out at night, and I don’t ride much at night. Nowadays I’m MUCH more nervous about distracted drivers, and I observe them with my own eyes, all the live-long day! A meaningful percentage of drivers in 2017 are driving as though their driving is an unpleasant distraction from what they really want to be doing – playing with a handheld gizmo! If they only put themselves in mortal danger, I’d say “Let nature take its course” – the law of natural selection. But far too often, they maim and kill people whose only mistake is to be in the path of destruction! It is criminal, and IMO should be treated as such! They kill and injure innocents, just as surely as if they pointed a gun and pulled the trigger. Life is a dangerous proposition. in one year, 362 Idahoans felt so hopeless about life they intentionally checked-out. 373 children in foster care in Idaho available for adoption to a loving forever family. Let’s try to love and respect one another in ALL that we do- including driving on our roads. My wife and I got t-boned by a guy holding a phone, while we were going through a green light. He challenged the illegal turn ticket in court, and when the judge found out he had a commercial drivers license, the judge treated him like a long lost son and threw out the ticket. This was with our car smashed on he side, and his on the front. Took over a year after the accident to finally get our insurance payout when the schmucks story fell apart in insurance arbitration. Not wearing seat belts? Sounds like Darwin at work! Technology in the form of self-driving cars will be the solution. Once distractible humans are taken out of the equation the death rate will plummet. With computers doing the driving people will be able to use their devices to their heart’s content without risk to themselves or others. Bob, Sorry, but I drive self driving airplanes. What they are selling with futuristic cars will never come to pass. Just way to many variables AND a requirement that the driver become even more sophisticated to monitor the technology. It’s a marketing thing. It is a great way to improve cars, but a true driverless car ain’t gonna happen unless we also give it a tube to drive in. Bob – as a guy who does tech-support for a living, I hope the car computers will be FAR more reliable than the computers (hardware and software) currently helping us with our various tasks! I’m not yet ready to surrender my family’s health and well-being to Microsoft Chauffeur 8.0!! You and I observed wandering over the road first hand in 2015 on a drive to Twin Falls. I won’t get a vehicle with any video display nonsense. Keeping my 2006 Chrysler. Bob T – Sarcasm?? I’ve had so many blue screens of death, computer freezes, and other non-life threatening computer glitches that the thought of a “self crashing car” scares me beyond words. Just wait till your car refuses to take you to the liquor store because… “Sorry Bob, but I’ve noticed you’ve been drinking too much alcohol lately, so I’m taking you to an AA meeting instead”. The main arguments against autonomous vehicle technology (safety concerns and lack of infrastructure) are essentially the same ones used a century ago by those who were opposed to the horseless carriage. The real issue behind many of the arguments appears to be a refusal to give up control. This will change once the insurance industry dramatically adjusts their rates to reflect the risks of manual driving versus autonomous driving. Creating self driving cars would be a gross mis-allocation of resources, and unnecessary waste of innocent pedestrians. I want the robot maid first, then the flying car, and thirdly all the free time all this marvelous technology was supposed to give me while I just pushed a button occasionally and lounged in my floating house. Yep, That’s right Bob. Let’s redesign the entire world so the self driving car can be a success. Musk is not a religious figure to me, sorry. Computers are so smart. Example: Did you know a white car in a snowstorm on a snow covered road is unable to trip the optical sensors used to control the traffic lights? It can’t see the white on white even though it has flashing lights and people waving fingers at it. Other examples are automated weapons systems that lock onto friendly forces or trees or birds.